Habanero Pepper Sauce will light a fire that you’ll be loath to extinguish. Yes, the sauce is that good! The habanero peppers add heat to the sauce while the canned peaches temper the flame. Canned peaches. I couldn’t believe it either, a hot sauce with canned peaches as an ingredient. The other components add depth to the delicious sauce. Once you taste this chili pepper sauce, you’ll throw out your store-bought variety and refuse to purchase more, especially when you see how easy habanero pepper sauce is to make. Warning: wear rubber or latex gloves before working with habanero peppers! These peppers are hot! The oil residue in the chili peppers will stay on your hands even after washing them with soap. Honey and I learned the hard way, and it was with the milder Hatch pepper. The habanero pepper is related to the Scotch Bonnet, which is one of the hottest peppers in existence. Once you wash, stem, seed, if desired, the habanero peppers, put them in a blender. Only then should you remove the gloves. Toss the gloves in the trash. Trust me; it’s easier than trying to get all of the habanero oil off the gloves. The rest of the recipe comes together quickly. You then pour the can of sliced peaches in with the habanero peppers. Next, you add the molasses, brown sugar, white vinegar, garlic cloves, salt, pepper, and spices. In the blender, mix all of the ingredients until they liquefy. The sauce should be smooth. Pour the habanero pepper sauce into a deep saucepan and over medium-high heat bring the sauce to a boil. Lower the heat so that the sauce continues to simmer for ten minutes. Once the habanero sauce cools, you pour into clean 5 ounce jars and refrigerate overnight before using. Store in the refrigerator. We hope you’ll sign on to our weekly newsletter and see what we’re cooking. Now that cooler weather is here, we turn up the burners. This sauce is the perfect combination of hot, sweet, spice and everything you want in your hot sauce. This makes a perfect gift for all your heat-loving friends and family. If you like this recipe please consider giving it a five-star rating. It helps others decide whether to try the recipe. Light My Fire Habanero Pepper Sauce has heat with a touch of sweetness. Hot has never tasted so good. 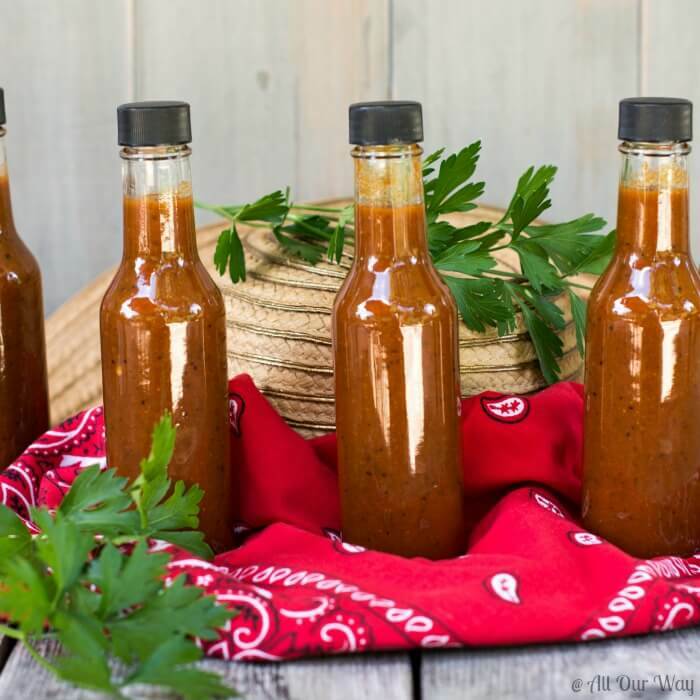 Easy to make and great to give as a gift to all of your hot sauce lovers. Be sure to use rubber/latex gloves when handling habanero peppers. The seeds in the peppers contain a lot of the heat. 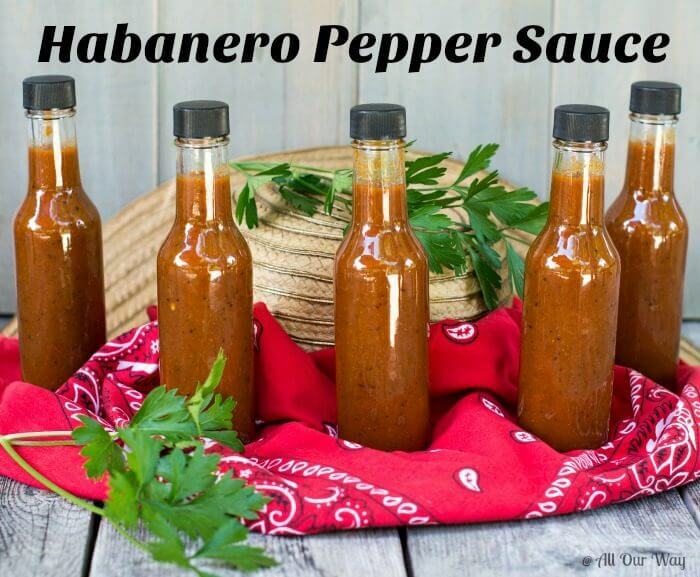 You can use less peppers and seed all of the habaneros for a milder sauce. Place the prepared peppers in a blender or food processor. Add the peaches, molasses, brown sugar, mustard, garlic, liquid smoke, vinegar and spices. Process until the mixture is liquid and smooth. Pour the habanero sauce into a pan and over medium-high heat bring to a boil. Once it boils, lower the temperature so that the sauce simmers for 10 minutes. Let cool and pour into clean jars. Refrigerate overnight before using. Store in refrigerator. The sauce should rest in the refrigerator overnight before consuming. This will make 5 -- 6 oz. bottles. Note: Recipes and content from © All Our Way are copyright protected. Please do not use content or recipe without prior written permission. If you want to share the information, please link to this post. Grazie. I only had four habanero peppers left from out garden so I added a jalapeno and a cayenne pepper to make a half batch. Using what I had on hand I also substituted hot Chinese mustard for the Dijon and apple cider vinegar for the white vinegar. It turned out delicious with plenty of heat from the four habaneros. Hi, Jonathan!! I’m glad you liked it!. Habañero peppers do have plenty of heat. Happy eating! I’m so happy I stumbled upon this recipe. We LOVE hot sauce. We put it on everything, and most of the store brands have a lot of unhealthy ingredients in them. I’m so excited to make this! Love the tip about wearing gloves when handling the habaneros. I actually had a horrible incident once from touching my eye after handling them. I’m glad you found the recipe, Debra! It’s so easy you’ll want to give some to all of your hot sauce lovers. Let me know how it goes. Have a great weekend. Hi, Joe!! You use everything that’s in the can — peaches and syrup. Happy sauce making!! Can I get a clarification on the peaches please. Am I supposed to strain the liquid off or simply dump the whole can, liquids and all, straight into the blender? We have an abundance of Caribbean Reds and I have struggled finding things to do with them. Thank you for sharing this simple recipe. Hi, Ky!! Yes, you dump the peaches and liquid into the blender. If you love hot sauce — this recipe is for you!! Hi, Sam! We’ve been making it for years and we haven’t had any problems. Make sure your containers are sterilized. We use glass because you can sterilize them. If you follow the directions you shouldn’t have any problems. Having the sauce come to a boil and then cooking it for 10 minutes plus the vinegar in the sauce also helps to preserve it. Be sure to keep it in the refrigerator. If you have any other questions we’ll be happy to answer. I have a question along the same line…do you have to keep the sauce in the refrigerator or can It be store in the pantry? I’ve gotten glass bottles with the drip lids, plastic covers and shrink wrap bands, I’m making this for Christmas…will this be enough to keep everyone safe? Hi, Nancy! If you process it with the drip lids, plastic covers and shrink wrap bands you wouldn’t have to keep it in the fridge. We keep it in the fridge because we don’t use a canner. Follow the canning instruction and you should be absolutely safe. Please tell me how to make the hot sauce now to save for Christmas gifts. Hi, Jean! We’ve never made the sauce this far in advance. It does last quite a while in the refrigerator because of the vinegar and sugar but we’re talking about 4 months. What we would suggest is to take the number of habaneros for one batch which is twelve. Chop them up in a processor and freeze them in an ice cube tray and when they’re frozen put them in a freezer bag until you make the recipe. When you’re ready to make the hot sauce, follow the directions. We’ve had good luck doing this with jalapenos. We really love the sauce — it is so good. It isn’t hard to make at all. You’re going to make some hot sauce lovers really happy!! This would be a gift to me. I’m the only one who eats and enjoys the hot sauce. I love the name of this post. Great gift idea for sure. Habanero peppers are definitely spicy and this would be perfect with a chicken side for me. Loving this heat with a bit of sweet. I have not made hot sauce…but this sounds fantastic. We use sriracha all the time. The peaches and spice blend in this sounds perfect. I will have to hunt down some peppers…maybe at the market. 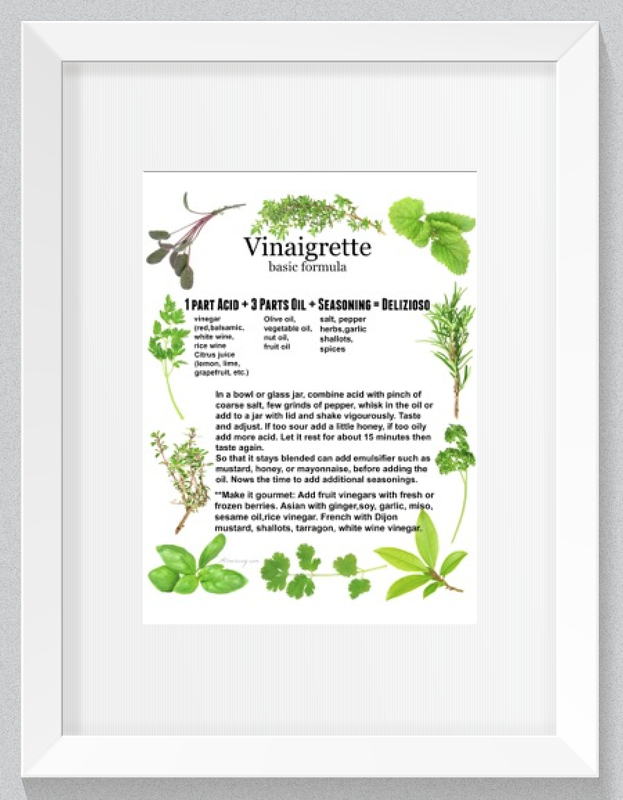 I agree…this is the PERFECT foodie gift. I know hubby is going to love this one. Printing it off right now. Gloria, your hubby will love it. I mean, it is so good!! It doesn’t really taste sweet nor is it so hot you can’t eat what you put it on. We love it!! My mother thoroughly believes that there is no such thing as too hot. I am making this for her birthday and see if she still thinks the same thing after tasting this. I can’t wait! On time I forgot to put on latex gloves before prepping peppers and wowza did I regret it! I couldn’t believe how loooooong they were on fire for! I want to try this sauce ASAP but will remember to get some gloves this time around. Ooh, yes, I learned the hard way about using gloves when handling hot peppers as well! I thought I had washed my hands really well and then rubbed my eye – ouch! This sauce looks and sounds delicious and I am so, so intrigued by the addition of canned peaches! Hi, Amy! If you have hot sauce lovers around they’ll really like this sauce. I love a good hot sauce but I’ve never thought to make my own. I do appreciated that you add many other flavors other than the peppers, so it’s full bodied and balanced rather than just hot. Well done! Oh!!! I love this- we go through a lot of habanero hot sauce in our house. How long does this last? I want to try making this for the hubs. He buys habanero sauce from Trader Joe’s all the time! Oh, this is something I definitely want to try around Christmas. I think it would be a wonderful present. Although, even now it would be perfect for Father’s Day. Do you use the syrup in the canned peaches also or just the peaches without the syrup. Also, how long will it keep in the fridge? Hi, Julia!! You use the syrup and all. We use the lighter peaches because it’s easier to use after the sauce is made. And we’ve had the sauce last several weeks in the fridge. We’ve never had it long enough to test because everyone uses it up!! Sorry, now I have the Doors stuck in my head. Love the salsa! I don’t know what it is about peach and habanero that go together so darned well. Love the touch of liquid smoke too. I think that just adds that special little kick to the sauce. Love that you went to the trouble of bottling it up so nicely too – it’d make a great gift! I’ve done so much work with chili peppers that I should really try doing something like that myself. Cheers! Hi, Sean!! Thank sauce is really something, isn’t it?? Yep, you got the song where I came up with the title of the sauce. 😂 The only problem if you give the sauce as a gift — your friends start whining for you to give them more. Happy Spicy Sunday!! Boy you weren’t kidding when you said to wear gloves… so glad I listened to you. My sister thought she was cool and didnt need them (lesson learned!). We loved the recipe… and have used it on both chicken and some ribs! Its hot, but so so yummy! Hi, Michele! So glad you like the sauce. Yep!! Nothing like experience teaching you what not to do. We’ve been there! Have a great day!! How can one not try a sauce with such a cool name? I love spicy foods and although habaneros can be a bit much for my palate, this sauce sounds and looks fantastic. I will have to make it soon! This is my first time visiting your beautiful blog and I’m impressed. I love the colors you’ve chosen. I feel certain this sauce wouldn’t last long in our fridge. Great tip about the gloves, by the way. Been there, done that! Keep up the great work! Light my fire! ah hahaha I love this name. And I LOVE the addition of the peaches; so smart. Can you can this? HAHAH…love the name of this post. We use a lot of sriracha here, and I have never made my own lot sauce. Might be fun project for a rainy day this summer. Not for the tame eaters…but so delicious. Ohh my husband will go crazy for this!! Not that I won’t, but habaneros are his fave!! Great warning about wearing gloves… I’e definitely learned my lesson! I would love to make a batch of this delicious sauce. It would perfectly with my spice loving family :). Will try it soon. Thnx for sharing this lovely recipe. Hi thanks for this recipe! I have a few habanero plants thats gave us thousands of beautiful peppers this summer and i’m already bottling my second batch of this! in addition to the canned peaches, I used a whole lot of fresh nectarines, apricots and plums as well as the were on sale at the local farmers market. 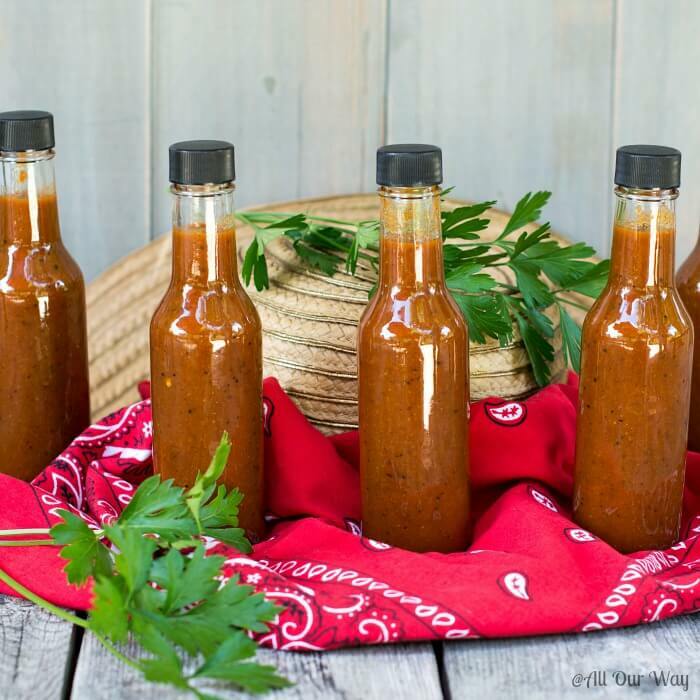 I quadrupled the recipe and used around 200 peppers per batch and although it was definitely hot, the background flavours and underlying sweetness really made this sauce amazing.. Thanks for the inspiration and a great recipe. Well, Your Highness, I am so glad you took the time to comment. I love that you’re experimenting with flavors! I bet your batches taste marvelous. We haven’t experimented with the different fruit but it certainly would be a wonderful endevour. We used to have a huge garden but we live in town now and can only grow a few habanero plants. We’ll just have to get lots of pots and plant them around the house. Thank you for commenting!! Hope you have a wonderful year and I’d love to hear from you again. I made this sauce today for the second time. Love it! It has a nice amount of ‘kick’. (I put about half the seeds in – did not use the smoke flavor as when I googled it it sounded too much like the creosote we get in the chimney from the woodstove – not very appetizing). I grew some peppers that I thought might be habaneros (it was a variety pack of seeds), turns out they are Hinkelhatz, which are ‘nearly as hot’ as habaneros. I had NO idea what I was going to do with the peppers till I found your recipe!! My husband and I can use only so much sauce so we are giving it away to family and friends! Our oldest son works with some hot pepper aficionados – they ate some of the peppers raw!! – can’t wait to hear what they think of the sauce!! Hi, Marilyn! So glad that you liked the recipe. It’s an old standby for us and our kids love it!! I certainly have never heard of Hinkelhatz — boy that would burn your mouth eating them raw. I may like spicy but that’s a little too much to eat plain. We do use the smoke flavor — you have to be careful not to add too much. It just gives the recipe a nice smokey flavor. I’m so glad you enjoyed the recipe. Have a Happy New Year!! I love making sauce at home too! this is my kinda version. Unfortunately the kids and ZIv won’t even look at it. Such babies when it comes to spicy!! Well more for me – right. I’m going to try this one soon. Love the color. We had a ton of habanero peppers this summer and just picked all the rest before our first frost here in New England. I made this to give as Christmas presents to those friends, I know, who love spicy foods. So easy and will look great in jelly jars. I live in Crete,Greece and had a glut of chocolate habanero chilli peppers I grew from seed…just made your sauce..phew !!! A little goes a long way but a lovely flavour. Thanks for this “Smokin’ Hot ” recipe !!! We love this recipe. I canned it last year and am going to make it again. We marinate wings in it and love it on our wild game. Our friends and family love it! Hi, I googled what to do with Habaneros and found this site immediately, and will be making this recipe for sure in the next few days. One question, do you pour in the whole can of peaches including the liquid? Thanks for posting I can’t wait to try it. Hi, Lora! Yes, we use the whole can. We also find that the lighter peaches work better than the heavy syrup. Let me know how you like it. We love the taste!! 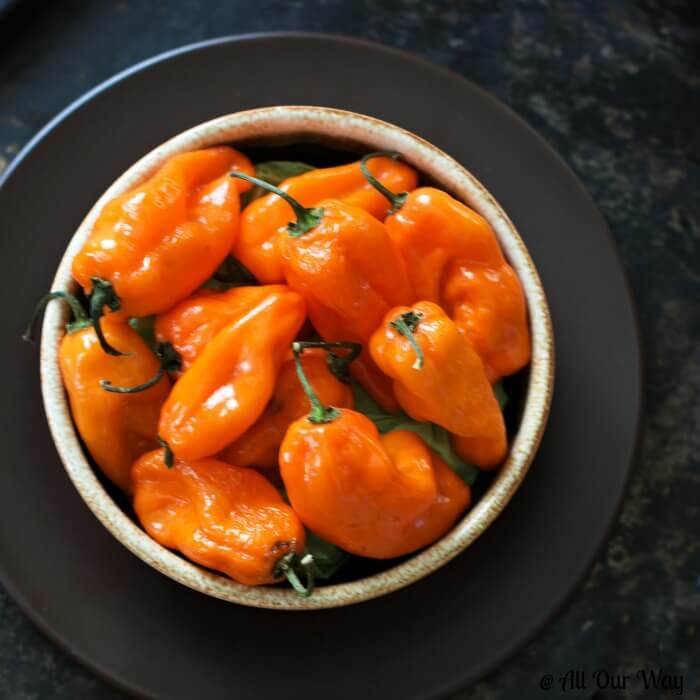 HI Marisa, came across this recipe looking for ways to use our abundance of habaneros….looks fabulous! When you say it lasts a long time in the fridge, what kind of time are we talking about….? Weeks? Months? Is this recipe shelf stable? Hi, Mark! We keep it in the fridge and it lasts a long time. In order to make it shelf stable, you would have to use a canner – I haven’t canned for years so I don’t know how long it would take. It’s fine in the fridge, though. I have a drawer of peppers and a few super ripe peaches that need to be used up. I also have a new box of vinyl gloves thanks to almost cutting my finger off this week. Looks like I’m ready to make this sauce this weekend! Can’t wait to try it. I see hot wings in our future. Good stuff. I also made a batch using pineapple and white habanero (heavy on the habanero). I named it Phosphorus because it burns white hot!!! Amazing. Oh man, I’m such a sucker for hot sauce. I put it on everything! We’ve got plans for several habenero plants in the garden next year, so I’ll be tucking this recipe away for future use. Thanks so much! I LOVE hot sauce but never get around to making my own. I will have to test this recipe out, I love really hot sauce! You’ll love it, April. It’s easy to make and the taste is wonderful. YES! I love this combo of peaches and habaneros. What’s your favorite thing to use this sauce on? This is a toughie because the family uses it on practically everything. The only dish I’ve not seen anyone use it on is desserts. 🤣 They are all crazy about it. I have always wanted to make my own sauce, I can’t wait to try it out! It looks delicious! Hi, Kim! You’ll love the recipe — it’s so easy and it tastes fantastic. Hi there, this looks great! About how many bottles does it make? Hi, Olivia! It makes 5 – 6-ounce bottles. I’ll but that in the recipe. It is excellent and it’s a family favorite and believe me, they’ve had plenty of hot sauces. Let me know how you like it. Thank you! I need to buy a few bottles. Wow, I love making sauces from scratch, but have never once tried to make my own hot sauce! This combo sounds fantastic! Hello, Monica! It is so good. The sweetness tempers the heat! I love adding hot and sweet sauces to my taco and rolls. This one looks so good.Loved your sauce bottles too. You will love this, Prasanna! It is so easy to make and the taste is better than store-bought. Oh wow I love this recipe Marisa! I love how simple it is and the canned peaches are such a good idea! My husband would love this so I think we might need to give it a try! I’m bookmarking this because I’ve been wanting to make my own habanero pepper sauce but had no idea where to start. This is aweeesome! I can’t wait to try it! I’m really getting into spicy but I’m not sure if I’m ready for habanero yet! It’s very tempting though. Hi, Cheryl! It really isn’t as hot as what you’d think. The peaches tame the flavor. You can try fewer habañeros and remove all of the seeds and veins in the pepper. Let me know if you do try it! I love habanero. I have tried couple of recipes with these beautiful peppers and they are simply amazing. Hello, Gunjan! This really is an easy and amazingly good recipe. I love hot, sweet and spicy sauces! I am going to get my son the culinary student and “sauce master” to make a batch of this! Pinned! Hi, Analida! This doesn’t take a whole lot of culinary science but it is so good. Our kids like it better than the expensive “name brands” and of course homemade is always better. We put that special ingredient in it — love. Just made this and it is amazing! I put too many peppers in it this time, but I will definitely make this again. Thanks for the recipe. Hi, Erin! Thank you for the feedback. We’re so happy you liked it. The recipe is great in that you can adjust the heat:-) Our family members like it hot; I like to breathe between bites! Going to have to show this to my husband; he LOVES to make his own hot sauces…. including Tabasco! This looks delicious! Wow that sauce even looks hot! What do you like to put in on? Your bottles are really cute. Hi, Jovina! It is hot but not unbearably so. We like to put in on eggs, chicken, fish, etc. It works well on just about anything.